The Guild GAD-40 Acoustic Guitar is your opportunity to own a solid wood dreadnought guitar at an unbelievably reasonable price. With a price tag of ~$699, the Guild GAD-40 is an all solid wood adaptation of the classic dreadnought guitar style that has become so popular all across the globe. The GAD-40 presents not just a highly refined sound and tone, but also constitutes a work of art in its own right. The abalone inlays and mother-of-pearl insets and dark mahogany bindings give it a very rich visual appeal, especially when doubled with the sunburst motif that puts one in mind of the classic guitars of the 50’s and 60’s. Made with a solid Sitka spruce top and solid mahogany body, the GAD-40 is an amazing piece of work and one which guitar reviews should take seriously. One will not find a solid wood dreadnought guitar that sounds this good without looking to the Martin D-42 Dreadnought which, at ~$4,899 is made up of solid spruce and rosewood. While the Martin is decidedly warmer than the Guild when it comes to tone, the Guild GAD-40 has a full-bodied flavor that is not easy to forget. In fact, it could easily be mistaken for a guitar double or even triple its price and it is a great guitar for those who appreciate the crisp clarity of the solid mahogany body and the solid projection of sound and volume that the broad shoulders and deep body of the dreadnought are famous for. 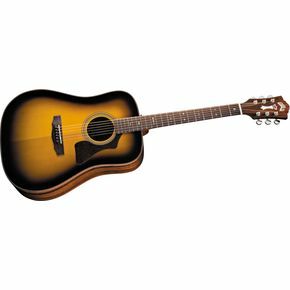 Regardless of whether you are a professional guitarist looking for a solid wood dreadnought that will sound great both on and off stage, or a relatively new player who is looking to upgrade to the depth and clarity of sound that only a solid wood guitar can offer, the Guild GAD-40 acoustic guitar may very well be what you are looking for. I would have to agree with the G.G. This is a really nice piece of work. At THIS pricepoint, however, I would be likely to question the embellishments on this axe. Is that REALLY INLAY?? Today, MANY guitars...even some costing more, have what appears to be inlay, but is, in fact. Microthin abalone applied to the surface of the wood BEFORE the finish is applied. Looks GREAT, but it is NOT inlay. This is a good SOUNDING guitar tho'...and that's what counts.